When it came to choosing my favourite United kit of all time I was pleasantly surprised to learn that the players and I are in complete agreement. The back and gold away kit worn between 1993 and 1995 is without question THE best ever worn, and the players voted it as such not long ago. Not only did it replace the upsetting and revolting royal blue 92/93 kit, with its ugly black badge pattern, it was the shirt worn by a certain Frenchman when he launched his infamous kung-fu attack at Crystal Palace. Not a moment to be proud of, for the player or the club, but still (perhaps wrongly) remembered with affection by the United support. 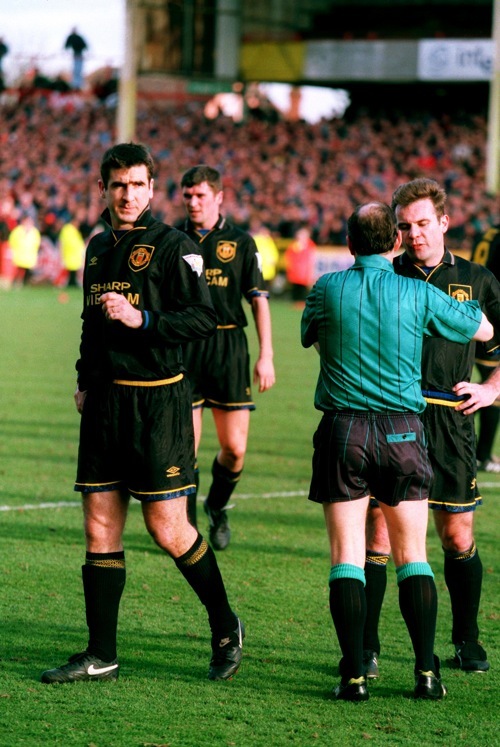 For me though it summed up what that black kit was all about. It symbolised the toughness of the team, the uncompromising side that was also sprinkled with pace and skill. I was delighted when our own hardmen ran out in that Sharp Viewcam-sponsored shirt. I’m talking Bruce, Robson, Ince and, of course, Cantona. In red they were feared, in black they instilled terror. Even the youthful and wiry Ryan Giggs looked like he could give it out as well as take it. Overall though, the black and gold was just COOL. It’s just a shame it was worn when Blackburn pipped us to the title in 1995. A special mention must go to the green-and-gold third kit worn between 1992 and 1994, commemorating the first kit ever worn by the club under the name Newton Heath in 1892. Classy. But the black would still shade it, if you excuse the pun. I used to love the shorts. Gorgeous kit. most black ones are. i’m thinking Chelsea, Milan. and also United 2007 away with the red go faster stripe down the back. True that most black kits are fantastic looking. I’m wracking my brain for the 2007 away kit and can’t picture it! Off to Google…! 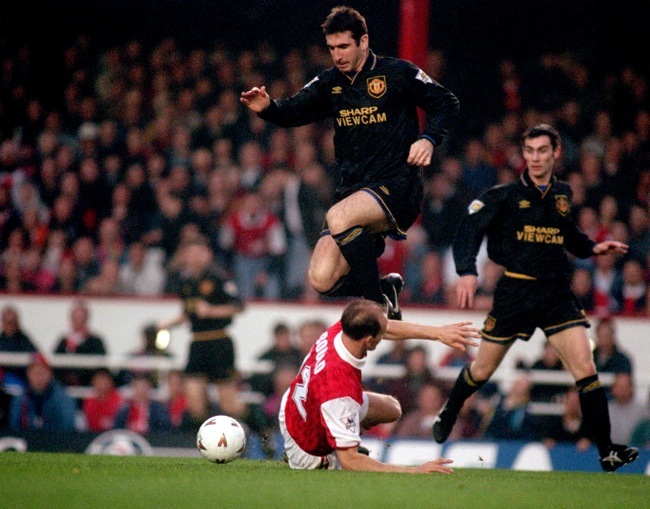 As you say Ben, it’s easy to forget just how HARD that United team was: Keane, McClair, Bruce, Cantona etc. A team of MEN. wish my mum didnt thow it out…. i know it would never fit me again!!! WOMEN!!! MEN indeed, Ollie, but not remembered for it, instead remembered for attacking (not to mention successful) football. Well, by me anyway! Ouch, Serv, that’s gotta hurt! Completely agree, made the point that this and the newton heath 92-94 colors were my favorite united kits when the theatre of dreams kit from 97 got favorite kit treatment. My dad passed down his old large black and gold kit to me when i was 10, and it still looks like a parachute on me today. But whenever I put it on, I have to take at least one look in the mirror and pop that collar up. What a kit..
well i’ve never met anyone who doesn’t like the black kit so that’s nothing new. i think that team far just fearsome regardless of what coloured kit they were wearing. Bit of a difference between ‘liking’ it and it being your favourite though. Off the back of this article I had someone tell me one of the blue kits was their favourite – I don’t get that personally, we should never blue (and I know about 68, I don’t care! ), but each to their own! I’m a City fan, and even I remember that kit as being a good one. It was highly intimidating, and one of the first (the first?) to be released after referees starting wearing non-black shirts. I was highly pleased when Umbro released a City away kit to match last season. Shame it was replaced after only one year. Yes I love that black kit myself; however I’ve always had a soft spot for the blue United away kits (a 1968 thing, maybe?) and didn’t actually mind that one they wore in the first season of the Premier League with the almost datestamp-like badge patter (not ugly at all in my opinion). I also think the all-blue away kit of 2002/03 complete with silver trim and Vodafone logo runs the black kit a very close second.